Still River Mill's core spun yarn is a roving wrapped around a wool core. This makes a very nice knitable, weaveable, or braidable product. It is excellent for weaving rugs! 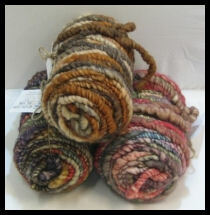 We can also wrap roving around a Jute core for added stiffness for weaving. Another option is to wrap a roving around a multi-colored, shiny core creating a dazzling effect. Let us know what you would like to create from your imagination!